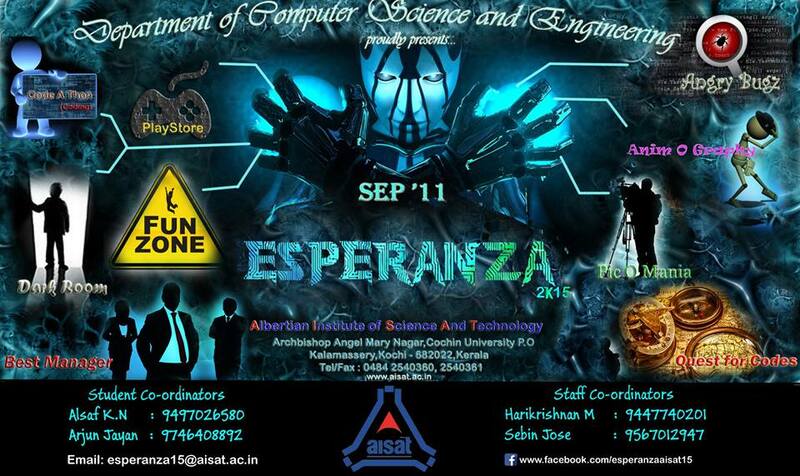 Department of computer science and engineering, AISAT, proudly presents inter college technical fest on SEPTEMBER-11-2015.Esperanza’15 is the first of it’s kind inter-college tech fest promising prodigious quality. The idea is to choreograph for a given song using animation. Contestants are allowed to use any animation software. They have to create a single character or a group of characters who dances along with the track provided earlier. General Rules · Will be an online submission event. · Individual or group with a maximum of 3 members. · A music track will be provided. Participants have to choreograph for it using animation. · Participants can use any type of animation- 2D or 3D, but the final output should be a video in mp4/ avi format. · The final shortlisted candidates have to produce their source code as well to the judging panel for evaluation. Judgment criteria · Idea · Design · Overall choreography · Synchronization/coordination · Should be in sync with the music track · Decision of judges will be final. In this event, the participants are required to design codes for given problems using C programming language, within the given time-frame. Requirement specifications: There are no such requirements to be made by the participants. All the equipment needed, will be provided by the department. Team Members: 1 ROUNDS 1. This event consists of 3 rounds. In the first round, a set of questions will be given to test the programming knowledge of the participant. This will be in the form of a quiz and it will be based on multiple choice questions using C/C++ Programming. This first round will be a knock-out round. The second round, concentrates on the error spotting skills and the ability to develop correct programs using C & C++- debugging round. (1 hour, 5 questions) · Compilers accepted: Code blocks, Turbo C++ etc. The third round consists of coding problems. 3-5 problems will be Provided and the participant has to execute those problems in the given time frame. Inter-college Technical Festival Department of Computer Science & Engineering Page 6 Venue: Programming lab Time: 9.30am – 3.30pm General Rules · This is an individual event. · The participants should produce valid ID cards. · Usage of calculators, mobile phone and any other electronic/mechanical gadgets will not be allowed inside the venue. · Participants will bear full responsibility of their components and equipment. Judgment criteria · Participants need to execute the given problem in the allotted time frame, which will be updated on the spot · Winners will be shortlisted based on their programming skills. About 10 images will be provided to each candidate, and they will have to edit it according to a specified theme. 4.Coding with Treasure hunt This event consists of two rounds, a non-technical round and a technical round. The non-technical round will be a treasure hunt in which the participants will have to hunt for the clues (which contains the algorithm for coding). When all the clues are found out, the coding round begins. Codes should be developed using the assembled algorithm. Round 1 Treasure hunt · Participants are to form a team comprising of a maximum of 4 ,minimum of 2 members. · Clues will be given in chits and participants are required to solve them to get the necessary algorithm for the coding. · 2 members are to search for the clues. Round 2 Coding · Implement the code using only the assembled algorithm. · The team who successfully obtains the correct output first will be proclaimed as the winner. · One computer will be allotted for each team. General Rules · Participants are to form a team of maximum 4 and minimum 2 members each. · The duration of the event is set for one day. · Registration is required for participation and there should be no duplicate accounts. · The program submitted by the participant will be considered correct if it gives the expected output for all the test cases. · Participants can compile and test the code before submitting. Programs should be written in C language. No other language will be accepted. · If any malicious activity (such as submitting the duplicate code) is detected, the user account will be deleted with immediate effect. · Rules are subject to change at any point in time. This event is all about building a stable floating model using popsicle sticks which can withstand the weight provided without sinking. Rules · A team must consist of three members. · Each team will be provided with equal number of sticks. · Time limit is 1hour. The participants should present their ideas about the various evolutions which they want in the existing technologies. General Rules 1. They should bring paint and whatever is necessary for the graphics. 2. Drawing sheets will be provided. 3. Teams of 2 members each. 4. Should try to convey their ideas about the technologies they want to include, to the maximum, using the picture. 5. Can include written details about specifications which should not exceed 100 words. Participants will have separate registration for gaming. · Wide range of multiplayer games will be provided. · Different rounds will be held for each game. · Gaming Consoles will be provided. A list of items will be provided to the participants, who will then have to search for them and click pictures of those objects, with 1 member of the team in the frame. The team to complete this task in the least possible time wins. Rules · Team of 3 members. · The list of items will be presented at the start. A huge board will be placed, and the topic will be displayed. · Interested participants can take the paper provided, sketch the cartoon, and pin it to the board. · Cartoons will be judged on the completion of all requirements and the relevance to the theme, artistry, originality, quality, and clarity of the accompanying description.